Leonora Carrington (England, 1917–2011). 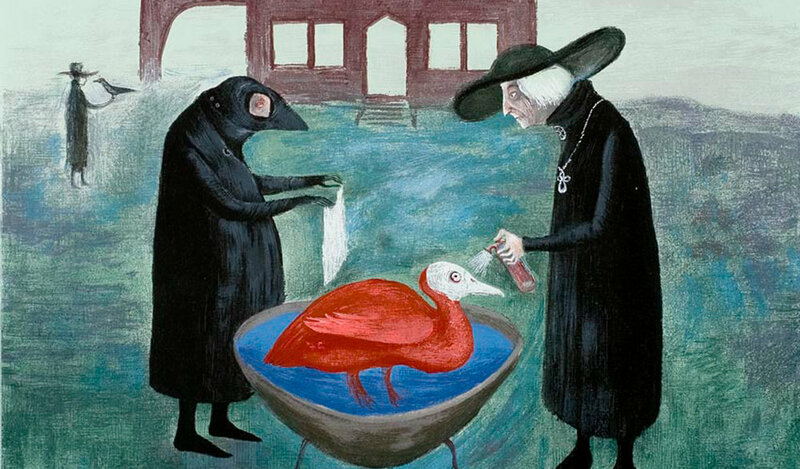 Bird Bath/Baño de pajaros, 1974. Color serigraph on paper, ed. 13/50. Robert Gumbiner Foundation Collection. Using works from MOLAA’s Permanent Collection, this exhibition investigates the way that viewers decide what constitutes “good” or “bad” art. Through interactive strategies, the curator asks visitors to explore the qualities of an object and expectations in ourselves that intersect when we look at art. The exchange between an individual and an artwork may result in visual attraction to a particular piece, and indifference, or even repulsion to others. Throughout each section: Fantasy, Myth and Imagination, Depicting the Figure, Depicting a Place and Abstract Ideas visitors are confronted with their judgment of a work of art and asked to reconsider that decision. Creativity often sprouts from an inexplicable source, inspiring some artists to create works that seem dreamlike, bizarre or out of the ordinary. The artists in Fantasy, Myth and Imagination have selected particular visual strategies and subjects to express their unbounded imaginations. Their works go beyond the possible and materialize imaginative spheres many of us just dream about. Pepe Mar (Mexico), and Antonio Berni (Argentina) utilize everyday materials such as paper, wigs or wood to create highly textured and striking works that challenge how we think about art materials. Leonora Carrington (England/Mexico) embraces surrealist strategies to recount mysterious narratives. Julián Navarro (Colombia) and Wifredo Lam (Cuba) base their work on myths and legends while artists like Judith Gutiérrez (Mexico) explore whimsical fantasies. The human figure is one of the most common subjects in the history of art. The portrait is a familiar theme used to memorialize individuals or record specific situations. Artists use depictions of the body to express cultural ideals, religious or political thoughts and archetypes of beauty. The photographs, drawings, paintings and sculptures in this section depict the human body in various forms. José Luis Cuevas’ (Mexico) figures represent the dark side of society while Sara Modiano (Colombia) uses her own body to express psychological drama. Political and social issues are discussed in the works of Natalia Iguiñiz (Peru) and Adrián Arguedas (Costa Rica). Sometimes, the sheer beauty or character of an anonymous individual or iconic personality is shown, such as in Leo Matiz’s (Colombia) photograph of Frida Kahlo or Claudio Bravo’s (Chile) drawing of a young soccer player. This section of the exhibition investigates the idea of the landscape, or a scene that depicts a particular place through the eyes of an artist. Alberto Rey (Cuba) takes a nostalgic look at a place from his childhood while Begoña Morales Bermudez Ruiz (Peru) deconstructs the idea of the modern home. Ofelia Rodríguez (Colombia) and Roberto Matta (Chile) offer symbolic and imaginative approaches to the landscape while the mysterious outdoors is the setting for Alejandro Chaskielberg’s (Argentina) photographs. Meanwhile, Joaquín Ferrer (Cuba) and Marta Palau (Spain/Mexico) transform urban and rural spaces through abstraction. Through direct or symbolic depictions, from memory or as a critical analysis of a place within a specific time, the artists in this section delve into sites with diverse meanings. The beauty of abstraction is that it cannot be confined to a specific time, place or idea. In Latin America non-representational art first appeared in the angular linear patterns of pre-Columbian textiles and art objects and continues to thrive in the contemporary art world. Joaquín Torres García (Uruguay) was one of the first artists to link Pre-Columbian iconography to modern abstraction in Latin America through Universal Constructivism. Another expression of abstraction can be seen in the work of Ana Sacerdote (Italy/Argentina) and her explorations of color. Alejandro Otero (Venezuela) and Daniel Senise (Brazil) use mundane subjects to create new abstract structures that resemble familiar objects but emerge as new forms. Francisco Morales (Mexico) and Pedro Terán(Venezuela) create subtle works that change depending on the viewer’s perspective and the amount of light that illuminates each piece. The artists in this section have adopted various degrees of abstraction, stripping images down to their basic elements to explore the beauty and aesthetic potential of line, color, form, everyday objects and materials.